The dialogue writers of 1991 couldn't possibly have anticipated this one. Aren't they ALL unintentionally funny moments? Although that one is pretty cool. How many unintentionally funny moments do you need to move a film into a new genre: The Unintenional Comedy? Not that it matters here - "Ajooba" has as many as are necessary and more. I might need to duck for cover when I say this, but I honestly thought Ajooba was not that bad. I realize that's not a true endorsement of it, but I had been led to believe I was going to be navigating the very depths of nonsense and ridiculousness, and quite frankly lots of this makes as much sense as some other masala romps - and more than certain brain-dead movies like Biwi No. 1. Proper write-up coming sometime soon, I hope. Is he holding his breath til he gets his way? 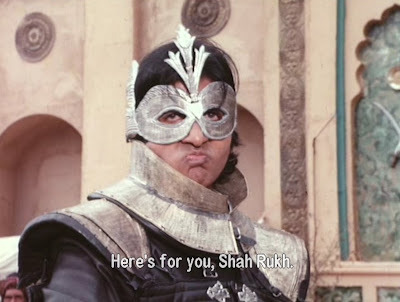 Or making classic Richard Burton style "puffy lips pouty face"? It's probably the only face he can make between that mask and collar. Not a lot of acreage there.